Designed as a uniquely versatile live sound mixer, WZ4 14:4:2 is equally at home at Front of House, on Monitors, or doubling up to fill both roles at once. 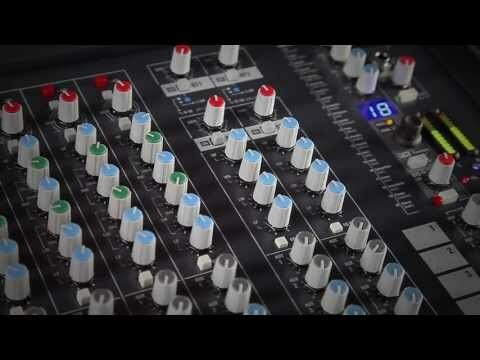 WZ4 14:4:2 features our acclaimed 4 band EQ with 2 sweepable mids, high quality 100mm faders, 6 aux sends, 12 segment bargraph metering and our unique QCC connector system for easy desktop, rack or flightcase mounting. This 4th generation MixWizard console now has the option to fit a multichannel USB interface with high quality 16 channel soundcard for easy multitrack recording and 2-track playback. If you’re looking for professional grade, all-purpose analogue mixers in a compact, rack mountable frame, the MixWizards continue to set the bar. In FoH Mode, the 4 groups with inserts, 100mm faders and XLR outputs can be routed and panned to the LR mix for flexible sub-mixing. The main LR mix has inserts, separate left and right faders, and XLR outputs to feed the main speaker system. EQ and signal processing can easily be inserted on group and main outputs. In Monitor Mode, the aux mixes are routed to the group and LR faders, inserts and XLR outputs. The AFL and PFL system is switched to the Mono output to provide an engineer’s ‘wedge’ output. In essence, it’s a perfect 6-mix monitor console with additional outputs available from the group busses via the aux master controls. In Dual Mode some auxes can be used as monitor mixes and some sub-grouping can be used along with the main LR outputs, allowing the engineer to run FoH sound and some Monitor mixes from the same console.